Consider offering your talents, your creativity, and your skills to help push the boundaries of the computer graphics field, showcase new technologies, and awake new opportunities. Be at the center of activity and help lead the way into the next generation of computer graphics by volunteering for a conference committee or subcommittee. When you complete the following application form and select Volunteer, your responses will be forwarded to the conference organizers, including all current Conference Chairs. Students please note: If you are interested in the conference Student Volunteer program, please do not use this form. 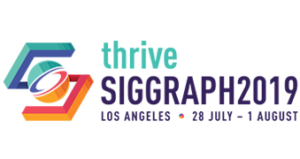 See the SIGGRAPH 2019 Student Volunteers page, as students have their own application. This form is for conference committee and sub-committee applicants only. CAG Chair and Conference Chair: CAG Chair and Conference Chair applications are handled separately from this form. Instructions for applying for either of these positions can be found at: CAG Chair or Conference Chair application procedures. What is your timeframe for volunteering? List any relevant volunteer experience and your duties/responsibilities. List any relevant professional experience. List any other interests, skills, experiences, or resources that you feel would be appropriate to include?